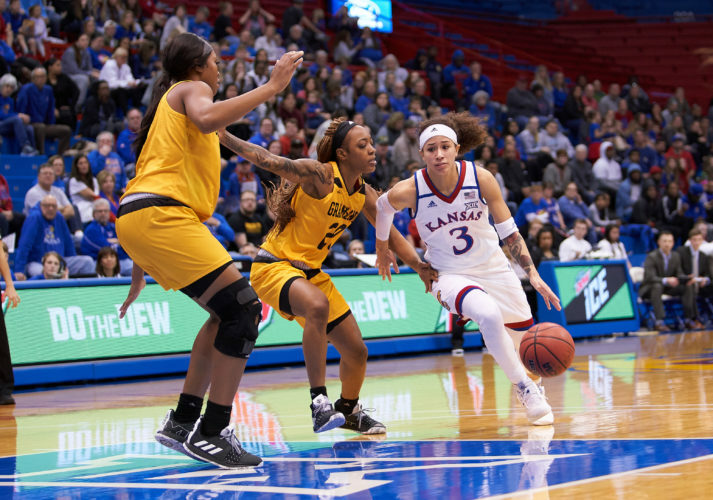 The Kansas women’s basketball team released its nonconference schedule Tuesday afternoon. For the 2018-19 season, the Jayhawks will play seven of their 11 nonconference games in Allen Fieldhouse. After a pair of exhibition contests, Kansas will host UMKC on Wednesday, Nov. 7 for the season opener. Kansas will start the season by playing five straight home games before traveling to LSU on Thursday, Nov. 29. Kansas also plays at Nebraska on Dec. 5 and travels to Las Vegas, Nevada for a two-day tournament in late December. The Jayhawks conclude nonconference action with a home meeting against Vermont on Sunday, Dec. 30. Head coach Brandon Schneider, who enters his fourth season at the helm, guided his team to a 12-18 record last season. The Jayhawks won their first seven games of the regular season before eventually posting a 3-15 clip in Big 12 play. Oct. 28 — Fort Hays State, Allen Fieldhouse, 2 p.m.
Nov. 4 — Washburn, Allen Fieldhouse, 2 p.m.
Nov. 7 — UMKC, Allen Fieldhouse, 7 p.m.
Nov. 13 — Oral Roberts, Allen Fieldhouse, 7 p.m.
Nov. 18 — Alabama A&M, Allen Fieldhouse, 2 p.m.
Nov. 21 — George Mason, Allen Fieldhouse, 7 p.m.
Nov. 25 — Iona, Allen Fieldhouse, 2 p.m.
Dec. 9 — Grambling State, Allen Fieldhouse, 2 p.m.
Dec. 19 — Washington State, Cox Pavilion, 4:30 p.m.
Dec. 30 — Vermont, Allen Fieldhouse, 2 p.m.